It is considered that the great poet, Saint Kabir Das, was born in the month of Jyestha on Purnima in the year 1440. That’s why Saint Kabir Das Jayanti or birthday anniversary is celebrated every year with great enthusiasm by his followers and lovers on the Purnima of May or June (Hindi month of Jyestha). In 2013, it was celebrated on 23rd of June, at Sunday. Kabir Das Jayanti 2015 was celebrated all over the India as well as abroad by his followers and lovers on 13th of June, at Saturday. Kabir Das, a mystical poet and great Saint of India, was born in the year 1440 and died in the year 1518. According to the Islam the meaning of the Kabir is The Great. Kabir Panth is the huge religious community which identifies the Kabir as the originator of the Sant Mat sects. The members of Kabir Panth are known as the Kabir panthis who had extended all over the over north and central India. Some of the great writings of the Kabir Das are Bijak, Kabir Granthawali, Anurag Sagar, Sakhi Granth etc. It is clearly not known about his birth parents but it is noted that he has been grew up by the very poor family of Muslim weavers. He was very spiritual person and became a great Sadhu. He got fame all over the world because of his influential traditions and culture. It is considered that he got all his spiritual training from his Guru named, Ramananda, in his early childhood. One day, he became a well known disciple of the Guru Ramananda. The house of the Kabir Das has accommodated students and scholars for living and studying his great works. There is no clue of the birth parent of the Kabir Das but it is considered that he was cared by a Muslim family. He was founded in Lehartara, a small town in Varanasi by the Niru and Nima (his care taker parents). His parents were extremely poor and uneducated but they very heartily adopted the little baby and trained him about their own business. He lived the balanced life of a simple house holder and a mystic. It is considered that he got his spiritual training came from the Ramananda, guru of the Sant Kabir. In the starting Ramananda was not agreeing to accept Kabir Das as his disciple. Once upon a time, Sant Kabir Das had lie down on the ladders of the pond and reading the mantra of Rama-Rama, in the early morning Ramananda was going for taking bath and Kabir come down below his feet. Ramananda felt guilty for that activity and then Ramananda was forced to accept him as his disciple. It is believed that Kabir’s family is still living in the Kabir Chaura in Varanasi. 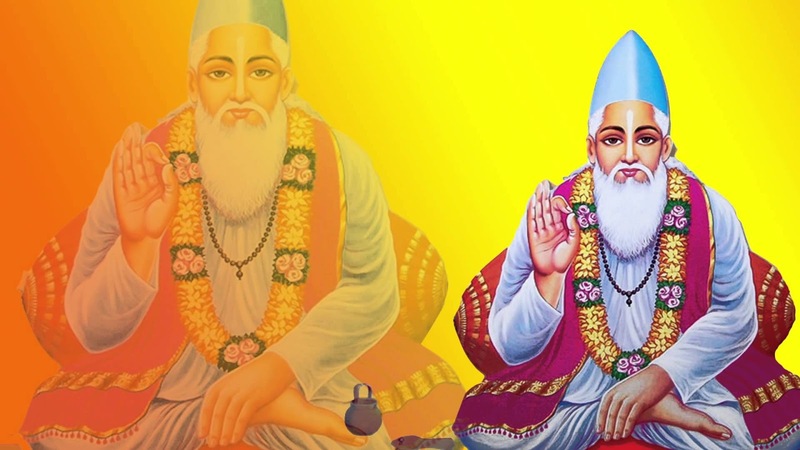 It is the photo of the Saint Kabir Math in the Varanasi where saints are busy in the singing Kabir Ke Dohe. It is the place of giving real education of life to the people. Kabir matha is located at the Kabir Chaura, Varanasi and Lahartara, Varanasi in the back passageways. Neeru teela was the house of his parents the Neeru and Neema. Now it has become the accommodation for students and scholars who study Kabir’s work. His great writing Bijak has huge a collection of poems which makes clear the Kabir’s general view of the spirituality. Kabir’s Hindi was a dialect, simple like his philosophies. He simply followed the oneness in the God. He has always rejected the murti pujan in Hinduism and shown the clear confidence in bhakti and Sufi ideas. He had composed the poems in a concise and simple style resonating the admire for factual guru. After being an illiterate he had written his poems in Hindi mixing with Avadhi, Braj, and Bhojpuri. He was insulted by some people but he never attended. All the poems and songs credited to the Sant Kabir are existing in the several languages. Kabir and his followers are named according to his poetic response such as banis and utterances. The poems are called variously as dohe, saloka and sakhi. Sakhi means to be memorizes and to remind the highest Truth. The memorizing, performing, and pondering over these utterances comprises for the Kabir and all his followers a way to the spiritual awakening. Kabirchaura Math Mulgadi is the home, historical work place and meditation place of the Saint-Shiromani Kabir Das. He was the only saint of his type, known as the “Sab Santan Sartaj”. It is considered as, the history of humanity is worthless without Kabirchaura Math Mulgadi just like all the saints are valueless without Saint Kabir. Kabirchaura Math Mulgadi has its own affluent traditions and effective history. It is the home of Kabir as well as the courageous vidyapith for all the saints. The Indian saints of the Madhyakalin India got their spiritual education form this place. It has been proved in the history of human tradition that it is not necessary to go to the Himalaya for the deep meditation, but it can be done by living in the society. Kabir Das himself was the ideal indication of this. He is the real indication of the Bhakti, living together with the normal human being life. He showed the way of free Bhakti to the people instead of worshiping stone. History witnessed that the tradition of here give the reputation and recognition to all the saints. The used things of the Kabir as well as other saints of his tradition are still kept safe and secure in the Kabir Math. The weaving machine, khadau, rudraksh garland (got from his Guru Swami Ramanand), rust free trident and all the other thing used by the Kabir someday are available at the Kabir Math. A historical well is here at the Kabir Math, the water of which is considered as mixed with the Amrit Ras of his Sadhana. It was first guessed by the great Pandit Sarvanand from the south India. He came here for arguing with the Kabir and felt thirsty. He drunk water and ask for address of Kabir from the kamali. Kamali told him the address but in but in the form of dohe of Kabir Das. Kabir ka ghar sikher par, jahan silhili gal. Pav na tikai pipil ka, pandit lade bal. He went to the Kabir for arguing but Kabir never accepted to argue and given Sarvanand a written of accepting defeat. Sarvanand returned his home and showed that paper of defeat to his mother and suddenly he saw that the statement was opposite. He was greatly influenced by that truth and again returned to the Kashi to the Kabir Math and became the disciple of the Kabir das. He was influenced by such a great level that he never touched any book in his rest life. Later, Sarvanand became famous as Acharya Surtigopal Sahab. He became the head of the Kabir Math after Kabir. Siddhapeeth Kabirchaura Math Mulgadi is located in the famous cultural city of the India known as the Varanasi. One can reach to the place by airlines, railway lines or by road. It is located about 18 Km from the Varanasi Airport and about 3 Km from the Varanasi Junction Railway Station. Once upon a time, the Kashi Naresh, Raja Virdev Singh Ju Dev came at to the Kabir Math with his wife to get pardon by leaving his kingdom. The history is: once, Kashi King called all the saints to his kingdom as he heard much fame of the Kabir das. Kabir das reached there to the kingdom alone with his small water bottle. He poured all the water of the small bottle on his leg, the small amount water started flowing on the ground for long way. The entire kingdom filled with water, so Kabir was asked about that. He said that, a devotee panda, in Jagannathpui, was cooking food in his hut which caught fire. The water which I poured, was for protecting the hut from being fired. The fire was serious so it was very necessary to get more water from the small bottle. But the King and his followers never accepted that statement and they want the real witness. They thought that the fire was caught in the Orissa city and Kabir is pouring water here in the Kashi. The King sent one of his followers for the investigation. The follower returned and told that all the statement of Kabir was true. The king became very shamed and he and his wife had decided to go to the Kabir math to get pardon. If they will not get pardon, they will suicide there. They got pardon and from that time the King was always united with the Kabirchaura Math. Samadhi mandir is constructed at the place where Kabir was used to of doing his Sadhana. The travel from Sadhana to Samadhi is complete here for all the saints. Till date, it is the place where saints are feeling the flow of huge energy. It is the worldwide famous place of peace and energy. It is considered that, after his death, people were quarreling of taking his body for the Antim Sanskar. But, when the door was opened of his Samadhi room, there were only two flowers, which were distributed among his Hindu Muslim disciples for the Antim Sanskar. The Samadhi Mandir is constructed using the thick stone bricks of the Mirzapur. This place was the workplace as well as the sadhanasthal of the Kabir das. This is the place where he had given the knowledge of Bhakti, Gyan, Karma and Manavta to his disciples. The place was named Kabir Chabutara. Bijak was the great work of the Kabir Das, that’s why the Kabir Chabutara was named as Bijak Mandir. Kabir teri jhopadi, galkatto ke pas. Jo karega so bharega, tum kyon hot udas. Saint Kabir Das, a Bhakti and Sufi movement saint of the medieval India, is extensively for his Bhakti movement in the North India. His life cycle is centered in the region of Kashi (also known as the Banaras or Varanasi). He was heriditarically related to the weaving occupation and cast of Julaha. His immense contribution towards the Bhakti Movement in India is considered as a pioneered one along with the Farid, Ravidas and Namdev. He was a saint of combined mystical nature (Nath tradition, Sufism, bhakti) which made him of a distinctive religion of his own. He said that the path of sufferings is the real love and life. In the fifteenth century, all the areas of life of people in the Varanasi were strongly held by the Brahmin orthodoxy as well as learning centers. To make free the people from, Kabir Das had to work hard to preach his idealogy as he belonged to the low caste, Julaha. He never felt difference among the people whether they are prostitutes, low caste or high caste. He preached to all by gathering self and his followers. He was ridiculed by the Brahmins for his preaching activities but he never criticizes them back and that’s why he was much liked by the common people. He started reforming the mind of common people towards the real truth through his couplets. He always objected the ritualistic and ascetic methods as a means of salvation. He said that goodness’s ruby has more value than the mines of ruby. According to him, the one’s heart with goodness includes all the prosperity of whole world. A person with mercy has strength, forgiveness has real existence of him, and individual with righteousness can easily attained the never-ending life. He said that the God is in your heart and ever with you, so offer inward worship to him. He had opened the mind of common people by one of his example that, if the traveler is not able to walk; what can the road do for traveler. He opened the deep eyes of the people and taught them genuine lessen of humanity, morality and spirituality. He was a follower and promoter of the ahimsa. He had turned the people mind of his period through his revolutionary preach. There is no real proof and clue about his birth and family, some say he was from a Muslim family; some say he was from high class Brahmin family. There was some disagreement among people related to the Muslim and Hindu about the funeral system after his death. His life history is legendary and still teaches the human beings a real humanity. According to the Kabir Das, real religion is a way of life the people live it and not made by the people own. According to him the work is worship and responsibility is like religion. He said that live your life, do responsibilities and do hard work to make your life eternal. Never go away from the responsibilities of the life like having Sanyasa. He appreciated and valued the family life which is the real meaning of life. It is also mentioned in the Vedas that living life by leaving home and responsibilities is not the real dharma. Living as a householder is also a great and real Sanyasa. Just like, Nirguna sadhus who live a family life, work hard for their daily routine bread as well as chant the name of God. He has given the people an authentic fact about what is the religion of human beings the one should have. Such preaches of him has helped the common people to understand the mystery of life very easily. It is considered that after the death of Kabir Das, Hindus and Muslims had claimed for getting the dead body of Kabir Das. Both of them wanted to do the funeral of dead body of the Kabir Das according to their own customs and traditions. Hindus stated that they want to burn the body as he was a Hindu and Muslims said that they want to bury under the Mohammedan rites as he was a Muslim. A temple of Kabir Das is made at the Kabir Chaura in the Kashi which has now become the great pilgrimage place for the people all over India as well as outside India. And a mosque of him was built by the Muslims over the grave which has become the pilgrimage for Mohammedans. He never differentiate between the Allah and Rama, he always preached to the people that these are only different names of one God. He said that there should be a religion of love and brotherhood among people without any high or low class or caste. Devote and surrender yourself towards the God who has no religion or caste. He always believed in the Karma of life. Kabir Das, a Sufi poet of 15th century, it is believed that he had chosen his own place of death, Magahar, which is located about 240 km away from Lucknow. He has chosen this place to die in order to remove the fairy tale (myth) from the people mind. Those days, it was considered that the one who takes his last breathes and die in the region of Magahar, would never get place in heaven as well as take birth of donkey in the next life. Kabir Das died in Magahar instead of Kashi just because of breaking the myths and superstitions of people. According to Hindu calendar in Vikram Samvat 1575, he left the world in the Maghar in the month of Januanry in the year 1518 at Magh Shukl Ekadashi. It is also believed that the one who die in Kashi, go to the heaven directly that’s why Hindu people go to the Kashi during their last time and wait for death in order to attain the salvation. Kabir Das died out of the Kashi to demolish the myth. His one of the famous saying related to this is “jo kabira Kashi mue to rame kaun nihora” means if there is a simple way to go to heaven just by dying in Kashi then what is the necessity of worshipping God. The teachings of the Kabir Das are universal and equal to all as he never differentiate among Muslims, Sikhs, Hindus and others of different religions. There is a mazar and samadhi of the Kabir Das in the Magahar. After his death his followers of Hindu and Muslim religion fight for the funeral of his body. But when they remove out the sheet from the dead body they only found some flowers taking which they completed the funeral according to their own customs and traditions. There is cave few meters away from the Samadhi indicates his meditation place before death. There is running trust named Kabir Shodh Sansthan which works as a research foundation in order to promote the research on Kabir Das works. There are running educational institutions as well which includes the teachings of Kabir Das. A great mystic poet, Kabir Das, is one of the leading spiritual poets in Indian who has given his philosophical ideas to promote the lives of people. His philosophy of oneness in God and Karma as a real Dharma has changed the mind of people towards goodness. His love and devotion towards the God fulfill the concept of both Hindu Bhakti and Muslim Sufi. It is considered that he was from the Hindu Brahmin family but espoused by the Muslim weavers without child, Niru and Nimma. He was founded by them into the pond of Lahartara (in Kashi) lying at a huge lotus leaf. At that time there was a lot of disagreement between orthodox Hindu and Muslim people which was the main focus of Kabir Das to resolve that issue by his dohas or couplets. Professionally he never attended classes but he was very knowledgeable and mystic person. He wrote his couplets and dohas in the formal language which was greatly spoken at that time which includes the Braj, Avadhi and Bhojpuri as well. He wrote a lot of dohas, couplets and books of stories based on the social barriers. The books written by the Kabir Das are generally the collections of dohas and songs. The total works are seventy two including some of the important and well known works are Rekhtas, Kabir Bijak, the Suknidhan, Mangal, Vasant, Sabdas, Sakhis and Holy Agams. The writing style and language of the Kabir Das is very simple and beautiful. He had written his dohas very boldly and naturally which are full of meanings and significance. He wrote from the depth of his heart. He has compressed the sense of whole world in his simple dohas and couplet. His sayings are beyond compare and inspiring. Kabir Das Birth PlaceIt is the great pond where Saint Kabir was found by the Neeru and Neema. It is located at the Saint Kabir Math Lahartara in the Kashi. Kabir Das Birth Place at LahartaraIt is the Saint Kabir Math located in the Lahartara Varanasi. What a great building of the peace and real education. Saints from all over the world come here to get the real education. Kabir DasIt is place where Saint Kabir was used to do the meditation and Bhakti Sadhana.